Home Care Sheets & Guides Do Betta Fish Need a Filter in Their Tank? Betta fish do need a filter, to help supply the oxygen they need to breathe. Ok, such a simple answer is a gross oversimplification of the subject. Let’s try again with more detail. We strongly recommend keeping some kind of filtration in your Betta tank to ensure your fish remains healthy and is able to thrive. It’s a vital part of basic betta care. But why do betta fish need a filter in their tank? OK, let’s get into some of the nitty-gritty of this debate. We’ll look at the origins of the Betta, why some people believe they don’t require filtration and different philosophies and techniques of caring for these beautiful fish. Natural Habitat: Where Do Bettas Come From? The “Yes” Argument: Why Do Betta Fish Need a Filter? What Kind Of Filter Should You Get For Your Betta? Bettas are native to the Mekong Basin of Asia. They’re found in shallow rice paddies and slow-moving rivers. Their natural habitat is one of extreme flood and drought. Because of this, it’s not uncommon for a Betta to suddenly find itself in a very small and shallow pool. There are many stories of people finding a betta living in a rain-filled hoof print of an ox. The fish is trapped there until the rains come again, or it can escape to a better location. Because of these harsh conditions that betta often find themselves in, they have developed the ability to breathe air directly from the surface of the water. The organ they use is called a “labyrinth” and has allowed our plucky little friend to survive environments most other fish would quickly find lethal. Like, for example, a tiny glass jar with no filtration. On a side note, Bettas are excellent jumpers. If they find themselves trapped in a tiny bit of water, they can jump out and make their way a surprising distance across land to a better place. This means if you come home to find your Betta dried out on the floor, don’t flush him yet. Put him back in the tank and give him a chance to rehydrate. You just might find out your fish is even tougher than you imagined. There are a million stories of Bettas living long lives in very small bowls on someone’s desk. The fish seemed happy and healthy, becoming a longstanding member of the family. Whenever I hear these stories, I wonder what they’re comparing “happy and healthy” to? How much happier and more active would those betta fish have been in a properly sized tank? Secondly, bettas come from a place of slow and gentle currents. In large rice paddies, they might not encounter any current at all. Our modern betta fish have been selectively bred to have enormous and beautiful fins. These fins can act like sails in a strong current from a filter, preventing the Betta from being able to swim and navigate their tank. While this is a valid point, this speaks more to the type of filter that should be used, not the lack of need for one. Finally, Bettas can breathe from the surface of the water. Because of this, the oxygenation of the water is less vital than with other fish. This helps to lend credence to the idea that filters are unnecessary. While our opinion here at ItsAFishThing opposing tiny jars and bowls is fairly strong, it should be noted that we have seen bettas successfully kept in half-gallon planted jars. While possible, this requires far more work and attention than most casual fish keepers are willing to give. The successful Betta jars we’ve seen have all been kept by dedicated and highly experienced aquarists. Bettas are fish like any other, and they create waste. This waste breaks down into ammonia, and that has to be removed somehow. Even in the wild when a Betta is trapped in a tiny pool of water, there’s more than meets the eye. Often there are plants drawing from that pool, helping to keep the ammonia and nitrates down. Spring rains still occur during the dry season, effectively giving the pool a water change. And their little pools may be part of a larger water supply, allowing toxins to leech out and away. None of these factors are found in a tiny glass bowl. Once you’ve decided that filtration is the proper way to go, what type of filter should you get? It cleans physical debris out of the water. It provides a huge surface area for beneficial bacteria to grow (see our article on cycling a tank for a more in-depth look at the nitrogen cycle). The most important part of the filtration process is the beneficial bacteria. Cleaning the debris from the water is nice, but that’s more for our benefit than the Betta’s. They don’t care if the tank looks pretty, they just want a clean, toxic chemical free environment to live in. Check out our article on the best filters for betta fish. A sponge filter is the simplest and easiest kind to use, and are ideal for tanks with betta. It’s an internal filter, simply made of a sponge-like material with an air pump used to push air bubbles up through the middle, drawing water through the sponge and allowing the bacteria to do its job. For small bio-loads, they’re excellent at keeping the water quality clean and have no moving parts to break. In addition, they tend to be the least expensive option. The disadvantages are they sit inside the tank, taking up space (so there’s less water!) and look kind of ugly. They do filter out some debris but will lose much of it back into the water as you pull the sponge out to clean it. They also require the purchase of a separate air pump. Remember, when you clean your sponge out (or any filter media), NEVER use water from the tap. It contains chlorine and chloramines, chemicals designed to kill bacteria in our drinking water that would make us sick.These chemicals will also kill the beneficial bacteria that has built up in your sponge. When you’re doing a weekly water change, simply squeeze the sponge out a few times in the bucket of tank water. This will knock most of the gunk loose without harming the bacteria. The HOB is a popular and efficient choice. 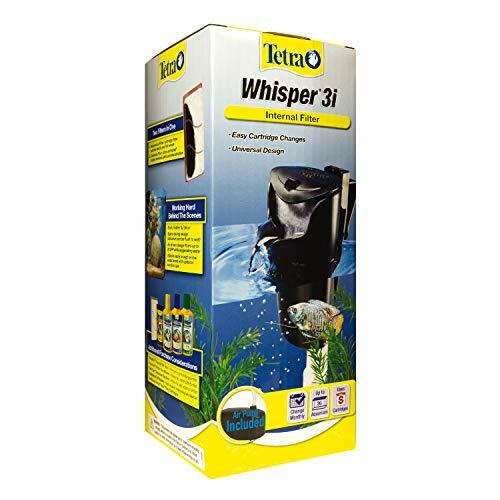 It removes the filter from the inside of the fish tank, provides more mechanical filtration than a sponge filter, and creates more water circulation. The downside of a HOB is they can create too much current for a betta, especially if the tank is small. The long colorful fins of a betta can make navigating this current extremely difficult. However, there are HOB filters with adjustable flow rates to help overcome this very problem. The AquaClear series by Hagan is a favorite of ours and an ideal filter for a betta. It boasts an easily adjustable flow rate and an excellent reliability record. If you choose to use a HOB, try to position it on one side of the tank. This will allow some calmer waters the other side that your betta can use to rest. We recommend placing a sponge pre-filter over the intake of the HOB. This will prevent the long and delicate fins of the Betta from being sucked in, as well as provide more space for beneficial bacteria to grow. Canister filters generally have the incredibly useful feature of an adjustable flow rate. So you can control the current in your tank. They also add a substantial amount of water volume to the tank. The canister itself holds water, effectively increasing the overall volume. Water your betta cannot swim in, granted, but any chemicals in the water are further diluted leading to a far more stable environment. 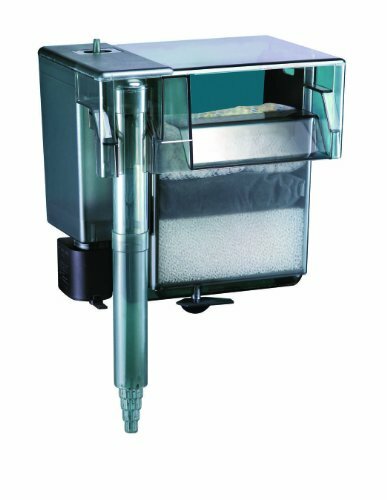 With canister filters you can position the intake and output pipes anywhere you like, allowing for complete control over water circulation within the tank. 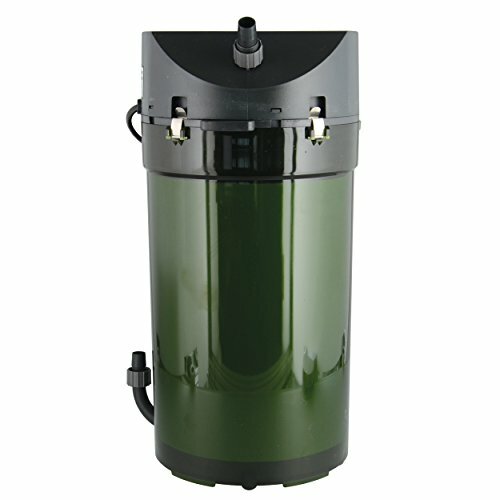 Finally, they have a greater volume to house filter media, offering a larger amount of mechanical and biological filtration, generally more than you’ll ever need for a Betta tank. But this, of course, is a good thing! The disadvantages are mostly due to the large size of the canister. It will sit beside or below the tank, so you will require more room to set it up.Though normally your tank will be sitting on a cabinet and this is used to house and hide the filter from view, so it’s not usually a problem. Canisters also tend to be more expensive than HOBs, but it’s because they’re a step up in quality. You get what you pay for! We recommend the Eheim brand of canister filters, especially the ECCO line. They are simple and reliable workhorses. Like the HOB, we recommend placing a pre-filter sponge over the intake tube in a betta tank to prevent their delicate fins potentially being sucked in and damaged. Hopefully, after reading this article you’ve come to the conclusion that you should have a filter to help your betta fish have the best life they can. Although it’s certainly possible to keep a betta tank without a filter, it requires deep knowledge, dedication, and a near-religious schedule of water changes. For the casual aquarist, a small and reliable filter will make the experience easier and more pleasant for everyone involved. Less maintenance work (water changes) for you, higher quality water for your betta. It’s a win-win. So, do betta fish need a filter in their tank? Yes, we’re saying they do. And we strongly advise you to provide one. For more information on keeping your betta fish happy and healthy, please see our section dedicated to complete betta care. I am having trouble finding a filter for my Betta. All the ones I’ve tried aren’t working. He either almost gets sucked into the filter or acts like the water curent is to strong or he acts like it hurts him. Do you have any suggestions? What filters have you tried? There are many that have adjustable flow rates so you can really turn them down. Undergravel and sponge / bubble up filters, though not the most effective, do suffice and have gentle currents. If you have existing filters, you can also try ‘baffling’ the intake by tightly tying some material from a pair of a tights onto it. This works in most cases, but be warned I have read of people ‘burning out’ their filters doing this. Also, how is the water from your filter returning to the tank? A spray bar can be a good solution as it spreads the return of the water across a much greater area, severely weakening any currents generated.